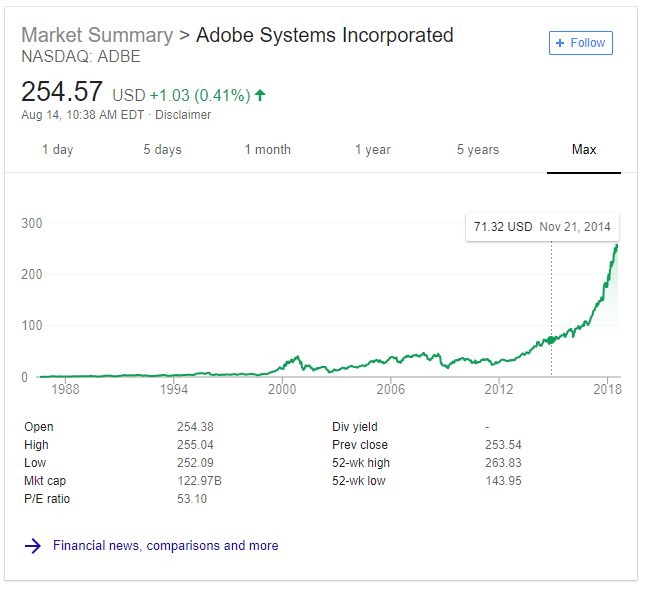 With the growing popularity of Adobe Photoshop, Lightroom and Premiere Pro coupled with Adobe’s subscription based revenue model, I would definitely think Adobe stock will grow much bigger in the future. Adobe currently has a Price to Earnings ratio of 53.10, I think the stock can hold a much higher P/E of 75. A 75 P/E would equate to $360 share price so I would certainly buy this stock for anything under $300. Just to put this in perspective Netflix has a P/E of 143. And undoubtedly the number one most-desired career among young people today is being a youtuber, which means using Adobe products like Photoshop and Premier Pro. Even if most of them don’t end up becoming full time youtubers, they’ll still give it a whirl, that means they’ll be on a Adobe Creative cloud subscription. To close it out, here is a disclosure at the time of writing the post I do not hold any Adobe stock. I also want to convey I’m not an expert at this field, and investing means risk, invest at your own risk.